At the entrance a mother was teaching a child to pray. Just outside the main shrine an older boy was learning how to waft incense smoke over himself from the cauldron. Adults were shaking sticks out of metal containers with one small hole in the bottom. The stick seemed to tell them which wooden drawer to open. Inside was paper which they read (? a fortune of some kind?) - in the case of this woman with great squealing and jumping up and down with glee! 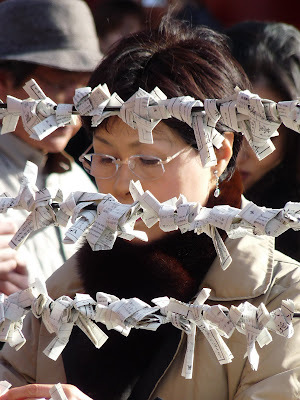 The papers were then twisted carefully over wires and left at the shrine. I love the first one of the little girl closly listening to her mother and learning to pray. Such a precious moment!